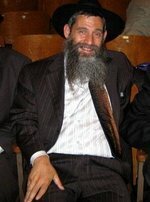 The current head of the Crown Heights Community Council, a Brooklyn, NY government body controlled by Chabad-Lubavitch, Rabbi Moshe Rubashkin is a convicted felon elected to his position only months after getting out of Federal prison. Now Rabbi Moshe Rubashkin and his 28-year-old-son Sholom Rubashkin have both been indicted on Federal charges stemming from the family's abandoned textile mill in Allentown, Pennsylvania. Rabbi Moshe Rubashkin was indicted for illegally storing hazardous chemicals at the abandoned mill. Sholom Rubashkin was indicted for making false statements to the Environmental Protection Agency regarding the mill's ownership. Shalom Rubashkin signed some of those statements using the name Sam Sternberg. The Rubashkins owe almost $500,000 is back property taxes, school assessments and fines on the Allentown property. The mill burned several times in suspicious fires, at least one of which, in July of 2005, was ruled arson. The chemicals Rabbi Moshe Rubashkin illegally stored there caused the fires to be much worse than they would otherwise have been. Indeed, firefighters tried to douse one fire with water, only to see it flare up and become dramatically worse. Water is not the agent of choice to stop this type of chemical fire. But the city had no idea the chemicals were stored in the abandoned mill. The Rubashkin family removed thousands of dollars of working industrial equipment just before the fires, but left the hazardous chemicals behind. A source close to the case told FailedMessiah.com that Skyline Industries – the property's "mortgage holder" – is controlled by members of the Rubashkin family. Rabbi Moshe Rubashkin "defaulted" on his "loans" just as Allentown was about to sieze and sell the then-intact but rundown property for back taxes and fees. Skyline Industries then gained "control" of the property, thwarting the city's efforts. Soon after, the property burned in the first of what would become several arsons. Now, just as the city is about to sieze the property from Skyline Industries – which is reported to be controlled by the Rubashkin family – Skyline transfers all but the most heavily damaged parcel to Southside Redevelopment, a company Allentown believes is also connected to the Rubashkin family. Rabbi Aaron Rubashkin, the family's patriarch, was not indicted, even though he was at one point, I believe, an owner of the Allentown mill and may have played a role in Skyline, as well. Why it took the EPA to get this on the Feds agenda is an open question. It might be worth noting that the US Attorney for that region is a former aide to Republican Senator Arlen Specter, himself close to Lubavitch. This also may explain the relatively minor charges – after all, the Rubashkins flipped the mortgage to avoid paying taxes and fines, and they left extremely hazardous material unsupervised while at the same time removing valuable machinery from a building that would soon burn. One would think charges beyond illegal storage of hazardous waste and making a false statement would be possible, especially when state lines were crossed and postal services used in these crimes. And I believe other family members were involved, as well. Both Rubashkins face a maximum of five years in Federal prison. Of course it is possible that more charges will be added as days go by, and that more Rubashkin family members will be indicted. Stories about the various Rubashkin mill fires and other stories about Rabbi Moshe Rubashkin are linked in the sidebar of this page.